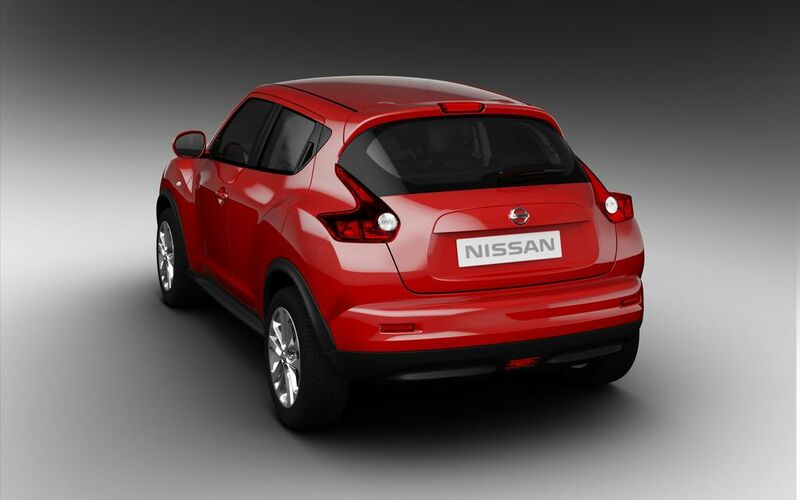 Nissan’s position as the pioneer of Crossovers is further strengthened by the arrival of Juke. Part SUV, part sports car, Juke breathes new life into the traditionally conservative B-segment of the market, providing buyers with a funky alternative to the conventional urban hatchback. Nissan is set to change the urban landscape… for the third time. Following in the wheeltracks of the Murano large crossover and then the successful Qashqai – the car that three years ago introduced the concept of a crossover as an alternative to the traditional C-segment hatchback – comes its younger brother, the Nissan Juke. Designed to bring a breath of fresh air to the B-segment, Juke is a distinctive combination of SUV toughness and sporting style. Conceived to inject some masculinity and dynamism into the small car market, Juke combines a number of seeming contradictions beneath its highly individual lines. Juke was created at Nissan Design Europe (NDE) in the heart of London, and refined at Nissan’s Design Centre (NDC) in Japan. Principle engineering took place in Japan with significant European input and Juke will be built in Nissan’s factory in Sunderland in the north-east of England and in Oppama, Japan. “The design shows real optimism. By combining design elements from two genres to create a small, but striking Crossover that displays a genuine confidence and style. And those are qualities we also expect to find in a Juke customer,” said Shiro Nakamura, Senior Vice President for Design and Chief Creative Officer. From a design standpoint, the lower portion of Juke is pure SUV, with chunky wheels, wide tyres, extended ground clearance and a robust stance. But the top portion is unadulterated sports car, with a high waistline, slim visor-like side glass graphics and a coupé-style falling roofline. The coupé effect is further underlined by the rear doors which have their handles hidden in the frame of the door. Inside, the sports car theme continues with a driver-focused cabin dominated by a centre console design inspired by a motorcycle fuel tank. Finished in a distinctive high gloss colour, the ‘bike’ console adds a sense of fun to the car. Practicality is assured by the rear-opening hatch and versatile luggage area with hidden storage opportunities. Based on the Renault Nissan Alliance B platform, Juke has a 2530mm wheelbase. On front-wheel drive versions, suspension is by MacPherson struts at the front with a torsion beam at the rear while four-wheel drive models have a multi-link rear suspension modelled on the system found on Qashqai. The ALL-MODE 4x4-i is a new development of Nissan’s respected electronic all-wheel drive system and now features torque vectoring technology to enhance agility and reduce understeer when cornering. In Europe, three different engines will be available when sales start later in the year (UK sales begin in October): one diesel and two 1.6-litre petrol units, all fully Euro 5 compliant. At the top of the range is a new turbo-charged petrol engine (MR16DDT) with direct injection. The engine is one of the most powerful in its class, developing 140kW (190PS) and 240 Nm. The combination of direct injection with a turbocharger provides the power and responses expected from a 2.5-litre engine with the economy of a smaller engine. The second petrol engine is a newly developed version from Nissan’s trusted HR-family. Designated HR16DE, the lightweight, low-friction 16-valve unit now has a unique dual injection system allowing finer metering of the fuel sprays for better combustion and develops 86kW (117PS). The K9K 81kW (110PS) 1.5-litre dCi common rail diesel offers excellent driveability – thanks as much to its heady 240 Nm of torque – with good economy and emissions. In terms of transmissions, the two-wheel drive turbo-charged 1.6-litre petrol engine is available with a six speed manual, while a CVT transmission with a six-speed manual mode will be available on the range-topping all-wheel drive version of the turbo-charged petrol engine. The naturally aspirated 1.6-litre petrol is available either with a 5-speed manual or the updated XTRONIC CVT and the 1.5-litre diesel engine is available with a 6-speed manual. Trim and equipment options will follow the established Visia, Acenta and Tekna lines while a full range of accessories has been developed for owners who want to personalise their Juke still further. “Juke is not a traditional B-segment car, and that is quite deliberate. It was born in an urban environment and that is where it will spend most of its life. Fittingly, its combination of agility and toughness make it one of the most streetwise cars around. 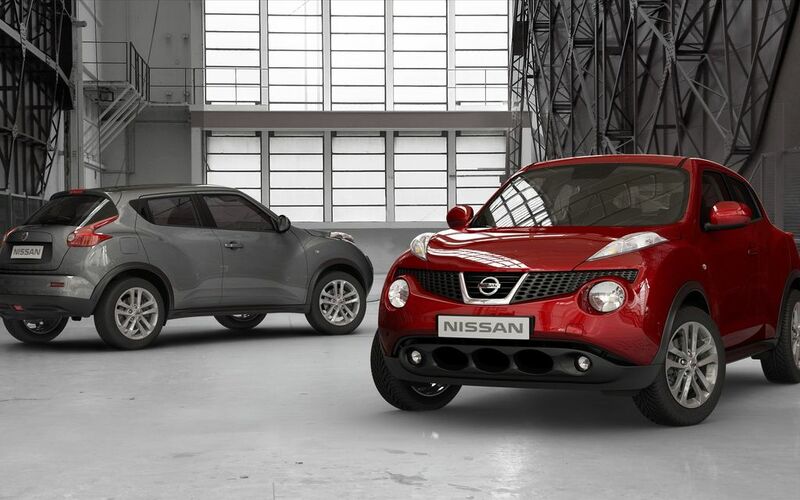 “Juke joins Murano and Qashqai to cement Nissan’s position as the leading brand in the crossover market,” said Simon Thomas, Nissan’s European Senior Vice President for Sales and Marketing. First revealed as the Qazana show car – unveiled at the 2009 Geneva Motor Show – Juke was created at the London-based Nissan Design Europe and refined at Nissan’s Design Centre (NDC) in Japan. Qashqai, also created at NDE, is sold in Europe, Asia and Australia while Juke will be marketed in Europe, Japan and the United States. “The outcome of this global collaboration is a car that comes from where East meets West, with vital contributions from NDE and NDC being key to creating such a striking design,” said Shiro Nakamura. Its highly individual lines are carried over virtually intact from Qazana. The boldness of the design reflects the significance of the B-segment in the European market: Europe is expected to take the lion’s share of sales ahead of the other main markets, including North America and Japan. The design team drew inspiration for Juke’s design from a number of unusual sources. They looked back at a number of vehicles synonymous with an active and sporting life – and that list included rally cars and motorbikes. It’s clear to see where those ideas have influenced the design. The result combines a number of different themes, but with Nissan DNA threaded through. It has a tough solid body to reflect the SUV element, yet is a very sensual car, too, with complex curves and a coupé profile accentuated by the narrow side glass and hidden rear door handles which help give the impression of two rather than four doors. But there is also clear Nissan family DNA in the design – the boomerang rear lights, for example, from the 370Z ­ – but none of the elements are slavishly copied so while retaining Nissan DNA, Juke stands alone as a unique, almost maverick, design. With generous ground clearance, big wheels and tyres, a high waistline and a broad shoulder line, the bottom ‘half’ of the car appears to be pure SUV. The impression is accentuated by typical SUV features such as the contrasting black sill and wheel arch finishers while at the front and rear, the lower bodywork emerges from underneath the car, resembling underbody protection. At the front, the ‘sump guard’ forms part of the air intake assembly but rather than use a simple meshed grille, the design team have developed the moulding into a series of circular slots… which are suggestive of biotic elements. Above the waistline, however, Juke shows its sporting credentials. A heavily raked windscreen, complete with Nissan’s signature Crossover upswept flick to the rearmost side window – and sloped roof-line provide a profile reminiscent of an aircraft’s canopy. The rear of the roof incorporates an integral spoiler to reduce aerodynamic lift to help high speed stability. The neat duck-tail ridge was perfected with computational fluid dynamics (CFD) and tests in the wind tunnel. The lights also reflect the car’s sporting agility. At the front these are split into two distinct elements. Framing the upper half of the bonnet, thin slashes contain running lights and turn indicators, while the main and dipped beams mounted lower on the nose of the car were inspired by the auxiliary lamps fitted to rally cars in the sixties and seventies. At the rear, the tail-lights put their own spin on the boomerang shaped lamps found on the 370Z. In total, a nine colour palette of exterior colours is planned, including two whites, a solid and a pearl, and three shades unique to Juke – Force Red, Haptic Blue and Machine Brown, though the total availability will depend on region. 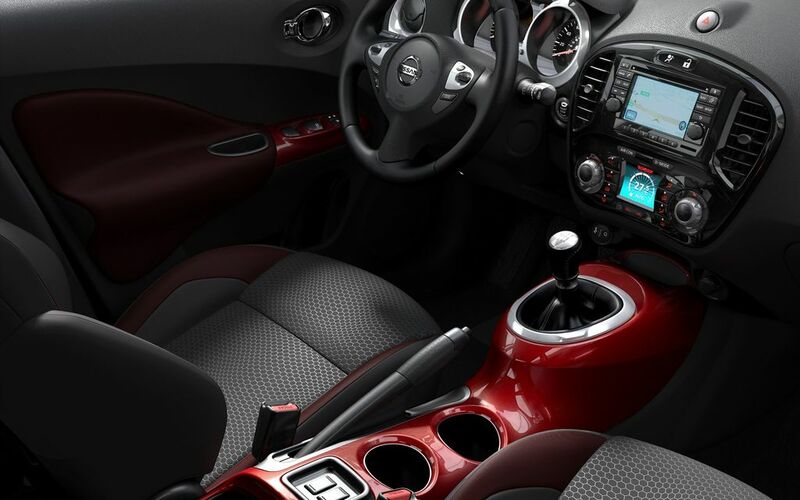 Juke’s active, sporting exterior is matched by its interior… where the dominant feature also displays a sense of fun: the centre console, finished in a high gloss paint, resembles a motorcycle fuel tank. Reflecting the exterior’s blending of SUV and sports car attributes, the interior provides the commanding driving position but with all the attributes expected of a sports car. The gear shift sits on the top of the ‘motorbiketank’ to guarantee slick changes while the tank itself is no mere styling statement but also provides a bracing point for the driver’s knee during spirited cornering. Similarly, the central stack – which incorporates the new Nissan Dynamic Control System – is ergonomically designed to ensure the driver has instant access to the information and drive mode controls. Attention to detail is evident everywhere. Chrome fittings and high quality materials are used throughout while the interior colours – red or gun metal grey for the central console are available, depending on the grade; black, silver or red accents to the leather or honeycomb ‘sports’ fabrics – underscore the car’s sporting attitude. Even the door arm rests, shaped like flippers used by scuba divers, reflect an active outlook. Despite its overall compact dimensions, the roomy interior offers competitive levels of space inside: front head room and rear knee room will be sufficient for most occupants. Unlike the Qazana show car, Juke is a full five seater. The practical luggage area is large enough to take a nine inch golf bag or a maximum size suitcase and it also includes an underfloor storage area (4wd versions excepted) which takes its potential capacity to 251 litres (VDA). In addition, the rear seats split 60:40, and also fold in one simple movement to provide a totally flat loading floor. To hide luggage away from prying eyes, the trunk area has an integral tonneau cover which differs from the conventional by being attached to the tailgate and rises with the door when the trunk is opened. “The interior displays a number of attributes which really sum up the entire car. There’s a lot of emotion here, a real sense of fun and a genuine quality,” says Albaisa. 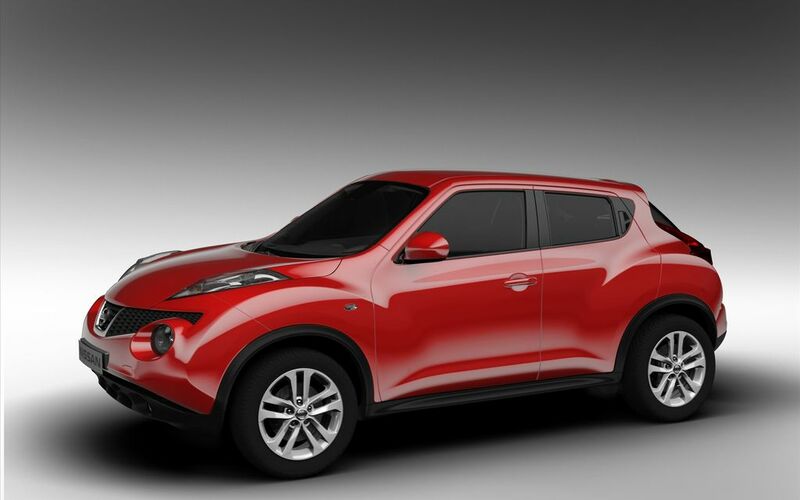 Juke is based on Renault Nissan Alliance B-Platform and has a 2530mm wheelbase, is 4135mm long, 1765mm wide and 1570mm tall. To allow the top of the range to use 17-inch wheels and 215/55 R17 tyres, the track front and rear is 1525mm, the widest yet seen on the Alliance B-platform. As new models evolve so a platform will undergo a number of changes, and Juke’s underpinnings are no exception. For its application on Juke, it has been lengthened, widened and significantly strengthened and lightened to enhance safety, refinement, and fuel efficiency. Although the basic suspension system mirrors that found on other B-segment cars, with MacPherson struts at the front and a torsion beam at the back, a new cradle-type front subframe has enhanced the lateral stiffness of the assembly. Along with revised front suspension geometry, this has helped to promote better handling and ride comfort along with greater refinement. The 4wd versions of Juke further benefit from a new multi-link rear suspension. When coupled to Nissan’s newly developed torque vectoring four-wheel drive technology to limit understeer, Juke’s handling is at the top of the class in spite of its higher ground clearance while comfort has been preserved. In an urban environment, the combination of higher ground clearance and large tyres mean that speed bumps and poor road surfaces will not cause as much discomfort – or damage – as they would to a conventional sports hatchback. Despite its SUV looks and the comparatively high eye-point, Juke’s front and rear roll centre heights are as low as possible – closer to a conventional hatchback than a typical SUV – to reduce body roll in corners. Agile handling is also helped by speed sensitive electric power steering, standard on all models, and by increased upper body strength and stiffness. 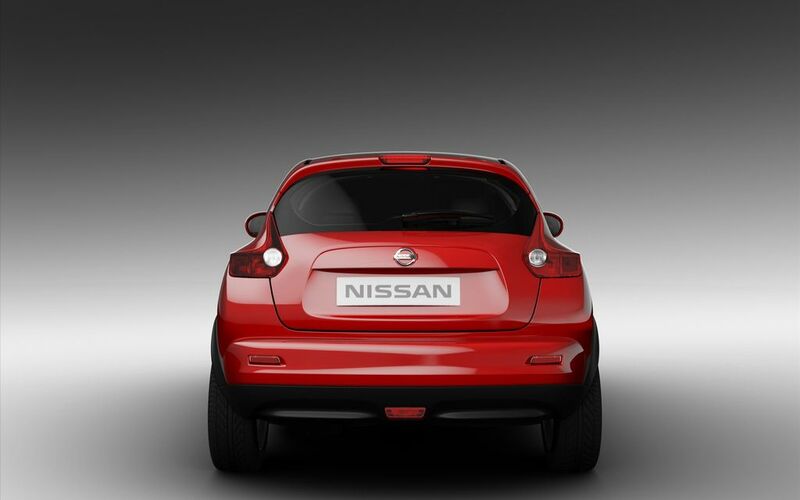 Juke incorporates a newly developed ring structure which connects the upper body to the rear suspension, thus increasing torsional rigidity. In Europe, there will be three engine and manual or CVT transmission choices when Juke sales start in the second half of the year. At the top of the range is a newly developed 1.6-litre Direct Injection Gasoline turbocharged engine which develops 140kW (190PS) and 240Nm. A low friction and lightweight design, the 16 valve engine uses direct injection to improve combustion to optimise power and torque, economy and emissions. The addition of a turbocharger and intercooler helps to boost power – this engine is one of the most powerful in its class – while variable timing control for both intake and exhaust cycles (twin VTC) improves low end engine response. A degree of overlap allows exhaust gas recirculation. Low friction techniques include the adoption of diamond-like carbon (DLC) coating for the valve lifters and mirror finish camshafts. The result is an engine delivering the performance levels of a normally aspirated 2.5-litre engine but with the fuel economy of a smaller engine. The Direct Injection Gasoline engine in two-wheel drive versions of Juke will be coupled to a six-speed manual transmission. On the four-wheel drive version, it will be mated to Nissan’s XTRONIC CVT transmission, with six-speed manual mode. The second petrol engine, which also displaces 1.6-litres and has four valves per cylinder, is an extensively reworked member of the HR family. Designated HR16DE, it has undergone a number of significant changes with a larger exhaust manifold, a retuned intake manifold, twin VTC, improved intake tumble flow and new catalyst with a hexagon cell formation. New pistons with revised crowns and integral oil jet cooling have been adopted along with low friction techniques such as diamond-like carbon coating on the valve lifters. But the most significant change has been the development of a dual injector system – a world first – which has two injectors for each cylinder, each with smaller nozzles to deliver finer, more closely targeted sprays of fuel into the cylinders for more efficient atomisation and more complete combustion. Together the changes have led to significant improvements in power, torque and fuel economy. The engine produces 86kW (117PS), representing a six per cent improvement over previous versions of the engine. Torque has improved by three per cent to 157Nm while economy figures show a 5.6 per cent improvement. The normally aspirated petrol engine powers two-wheel drive versions only, and will be available with either the five-speed manual or the updated XTRONIC CVT transmission option, a different CVT transmission to the one used with the DIG engine. The final engine choice is the familiar Alliance developed K9K 1.5-litre dCi turbocharged common rail diesel. The 1,461cc eight-valve engine delivers good fuel economy, low emissions and running costs with excellent driveability. With power rated at 81kW (110PS) at 4,000 rpm and torque at an impressive 240 Nm at 1,750 rpm, this unit features a fuel return rail and control unit for improved fuel efficiency. Injection pressure is 1,600 bar. Improved glow plug performance speeds up cold start performance. Emission control systems include a diesel particulate filter (DPF), with a fifth injector for regeneration and cooled exhaust gas recirculation while the turbocharger layout altered to make the distance between it and the DPF as short as possible. The diesel will be available on two-wheel drive models with the six-speed manual transmission. For Europe, all the engines are fully Euro 5 compliant. While the manual transmission has been carried over largely unchanged from Qashqai, both XTRONIC CVT systems feature a number of key technologies that promise significant improvements in weight, packaging, performance and fuel efficiency. The updated XTRONIC CVT unit, used with the conventional 1.6-litre petrol engine, is 10 per cent shorter than before and 13 per cent lighter while internal friction has been reduced by a remarkable 30 per cent. This unit is the world’s first CVT with a sub planetary gear which allows a far higher transmission ratio – 7.3:1 – than previous Nissan CVTs. Smaller, lighter pulleys, a flexible lock up damper and a more efficient oil pump all promote great fuel efficiency. The XTRONIC CVT with 6-speed manual mode in the turbocharged petrol-engined Juke has been tuned for a more sporting performance with revised manual modes for sharper acceleration while the management system has been reprogrammed to enhance fuel efficiency. Both CVTs have adaptive shift control systems that can be selected via the Nissan Dynamic Control System. Unusually in its class, Juke will be available with the option of four-wheel drive in addition to conventional front-wheel drive. A newly developed all-wheel drive system is based on Nissan’s ALL-MODE 4x4-i electronic technology but which now adds a lateral torque-vectoring capability to its armoury. As well splitting torque front to rear – up to a maximum of 50:50, it can now be split from side to side across the rear axle, too. By monitoring vehicle speed, wheel speed, gear position, steering angle, lateral G forces and now vehicle yaw rate, torque distribution can be increased to the outside rear wheel in corners to cut understeer and enhance the car’s cornering ability. In total, up to 50% of the total available engine torque can be sent to either rear wheel. The new rear axle incorporates electric couplings at either end plus a new final drive. The inclusion of this innovation is a first in the small car segment – a technology that has, until now, only been found on top-of-the-range, premium vehicles. The new system is noticeably lighter and more compact than similar systems used by some other manufacturers. Just about the only conventional aspect to Juke is the model line-up, which follows Nissan’s established Visia, Acenta and Tekna lines. Lists of standard and optional equipment will be released nearer the on sale date, but expected items such as climate control, leather upholstery, rear view camera and Intelligent Key will all be available to Juke customers along with some more unusual features. One such is Nissan Dynamic Control System, a central command and display module which allows the driver to alter dynamic drive settings as well as make changes to more obvious functions such as climate control. Cleverly, the module adopts different displays, colours and functions depending on how it is being used. In Climate mode, the display shows the interior temperature setting while the ‘buttons’ display air-flow preferences. But in D-Mode, the buttons change to Normal, Sport and Eco driving modes, altering throttle maps, torque availability, CVT shift schedules, steering effort and even air conditioning performance to suit the conditions. The display, meanwhile, shows engine and drive related dials and information. Car settings, such as the sensitivity of automatic headlights, can also be adjusted via the system, while the display changes colour to signify what type of information is being displayed. Driving information incorporates panels giving average speed, fuel economy, journey times and so on. Overall, the display is designed to add a feeling of cool, engaging technology to the interior. Although Juke has a long list of standard equipment, Nissan has developed a full range of accessories enabling owners to personalise their cars still further. Among the items on offer are different designs of alloy wheel as well as front and rear under body protectors to accentuate the SUV element of the design. Other exterior features include exhaust finishers, a roof spoiler and wind deflectors on the doors, while inside an owner can add illuminated door sills and interior accent lighting. Practical touches include advanced security systems as well as extra storage opportunities in the front armrest and in the luggage area. “The incredible success of our Qashqai compact crossover – we’ve recently passed half a million sales in Europe alone - has shown that customers are fed up with conventional cars. Juke is even bolder, even more adventurous than Qashqai and is set to confirm Nissan’s position as a pioneer of crossover in Europe and, indeed, globally,” says Simon Thomas. Juke has been conceived with the specific intention to fulfil unmet customer expectations by adding much dynamism and masculinity to the sober, safe small car market. Who does Nissan imagine will buy Juke in Europe? Clearly Urbanite, male customers are expected to be predominant but a significant proportion of buyers are anticipated to be women – one third according to Nissan’s estimates. Nissan Juke will attract a younger audience than average Nissan customers (under half will be below 40), these estimates shows that Juke will have a broad appeal, supporting Nissan’s research that there is widespread disillusionment at the lack of excitement in the small car sector in Europe. Sales of Juke will come largely from the B-segment and is also expecting to attract C-segment customers, with people trading down to enjoy something more radical and inspirational. 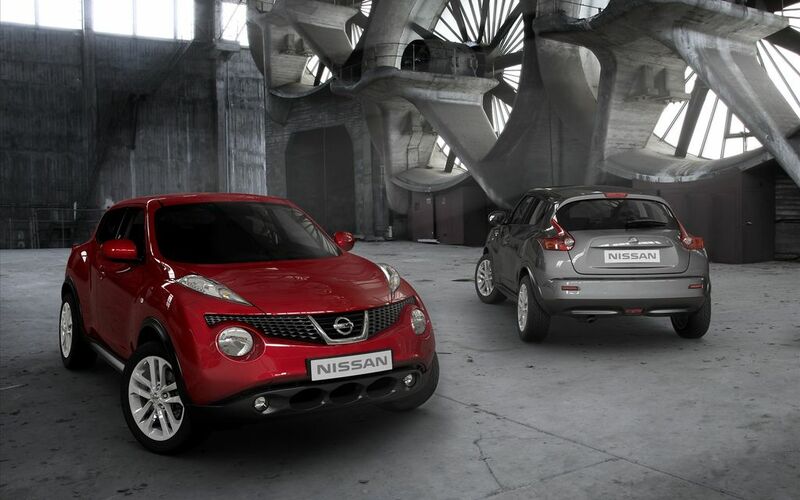 As withthe successful Nissan Qashqai, a large majority of Juke customers will be new to the Nissan brand.